Carols from King's, the Christmas Eve carol service of Cambridge University, is one of the most famous carol services in the world. And anyone with the patience to stand in the queue can go for free. But before you head for King's College Chapel in Cambridge, England, make sure you know which service you're planning to attend. 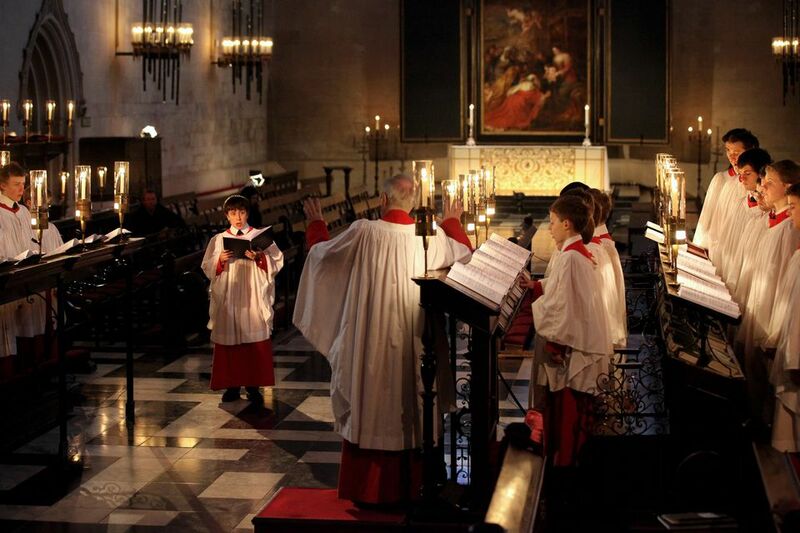 There are two popular broadcast carol services from King's. Only one really takes place on Christmas Eve and only one is open to the public. The familiar televised carol service with its robed choristers and candlelight, shown on Christmas Eve by BBC2 and around the world on BBC television outlets, is actually recorded early in December with an invited audience. They've been doing it that way, pretty much, for about 60 years. It's a completely different service from The Festival of Nine Lessons and Carols, broadcast live on BBC Radio 4 at 3pm GMT (10am EST and 7am PST) on Christmas Eve, and around the world to millions of listeners throughout the holiday season. This is the one you can attend - with a little patience and a warm coat. The service, adapted from one created in 1880, was first held at King's on Christmas Eve in 1918, a little over a month after the end of World War I. It was first broadcast by the BBC in 1928. Today, at least 450 radio stations, including the American Public Media network, carry the broadcast. Since it has been around for nearly 90 years and, since thousands of churches have adopted its format, there's a good chance you grew up listening to it. People begin lining up at 7:30am when the first members of the public are admitted to the grounds of King's College. Entrance is only through the main gate on King's Parade. All other gates into the College are locked. The college porters count the number of people joining the line. Once there are as many lined up as there are seats available in the chapel, the porters tell new arrivals that they're unlikely to be seated. Generally, anyone in the queue by 9:30am will probably get a seat, but it's not guaranteed. Dress up warmly and consider bringing something portable - like a folding walking stick seat - to sit on because the doors to the chapel don't open until 1:30pm. The service starts at 3pm and ends at about 4:30pm. Once you're inside the college grounds, restroom facilities are available and the college coffee shop is open and serving refreshments. You can't bring bags, packages or your folding seat into the chapel but you can leave all that with the porters in a designated area. A limited number of advance tickets are available for people unable to stand in the queue because of disability or illness. Demand for these tickets is high so if you'll need one you must apply by mail. In 2018, they seem to have shaved a whole month off the mail application period; it now ends September 30 instead of the end of October, as in every previous year. So if you haven't applied for tickets this year, you are out of luck. Just get your postal application in as soon as the application period opens, May 18, for a better chance next year. Send applications to The PA to the Dean, King's College, Cambridge, CB2 1ST United Kingdom. King's College Chapel is within the ground of King's College on King's Parade in the center of the town. Public transportation on Christmas Eve ends earlier than normal and is usually very busy but if you plan ahead you should be able to reach King's College Chapel relatively easily. Regular direct trains leave London King's Cross Station for Cambridge from very early in the morning. The trip takes about an hour and 20 minutes. There are also frequent trains from London Liverpool Street Station, via Stansted Airport. This train takes about an hour an 40 minutes. Plan on leaving London no later than about 6:15 a.m. (that's right, 6:15 in the morning) if you want to arrive early enough for the carol service queue. The cheapest, advance round trip fare (in 2018) is about £36, but train services between London and Cambridge are scheduled to be disrupted in December so you may want to consider driving, taking a coach or even staying over. Return services end earlier than normal on Christmas Eve so be sure to book your ticket well in advance. Check National Rail Enquiries for schedules and to book your train - the sooner you book the cheaper it will be. The train station is about 1.3 miles from the city center. If no taxis are available, take buses 1 or 7 to Cambridge Emmanuel Street. Both services run on Christmas Eve. Services between Victoria Coach Station in London and Cambridge city center take anywhere from about an hour and 45 minutes to three hours on Christmas Eve. The round trip fare, purchased as two one-way tickets, is about £15. I don't actually recommend the bus journey for this particular journey. To arrive in time to queue up for Carol's at King's you'd have to catch a bus at 4:20am and the return journeys, from about 5pm onward take up to 3 hours. Check National Express Coaches to times and fares. Cambridge is a small city that is largely pedestrianized in its center. It will be congested with last minute shoppers on Christmas Eve. If you plan to drive from London, plan on allowing plenty of time. It may only be 63 miles away but it is not the easiest 63 miles on any day, let alone Christmas Eve. Your best bet is to choose the town's Park and Ride parking lots, where you can park on the outskirts of town and take a reasonably priced local bus (usually for one park-and-ride fare) to the town center. The Madingley Road Park&Ride is the closest to King's. Parking is £1 for up to 18 hours and the bus costs £3 each way. On Christmas Eve 2016 there is a normal Saturday service but the first bus leaves the parking area at 8am. City center parking is available but when you add up the amount of time you may be waiting in line plus the time for the service itself, you could end up spending abouat £30 to park. The nearest city center parking is the Grand Arcade car park on Corn Exchange Street, Cambridge CB2 3QF. Traveling to York is Easy - Why Not Try It?